Just a quick taste here from deep in the crowd. (They opened for the Kongos the other night on Taos Plaza.) I can never get enough of this music, always moved that it comes from right here. D.H. Lawrence called it “the deep voice of the Earth calling out,” and when you realize that the culture is way older than Jesus, the description makes a lot more sense. I especially loved the little guy. 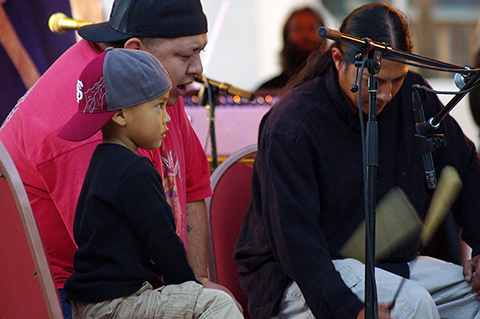 The man next to him appeared to be his dad,* and I only saw a little bit of discipline one time, when the boy was restless between songs and started drumming on the microphone. What a cool thing to be up there with your old man beating on a drum. Would have happened to me like never. The main act, the Kongos, are supposed to be hot right now. They played just fine but might as well have been lip-syncing. The sound was totally polished like on the radio. The energy seemed a little forced. I didn’t sense any real passion. No goosebumps, you know? Give me rock and roll or Indians, any day. * Or maybe the other guy up there who’s dressed the same? I love that sound. Makes me emotional,sometimes. It did that to us when we first heard it in person at a pow-wow. (Still can.) The sound of this place. It’s like the ultimate grounding. Awesome!! I enjoy every single one of your posts. You truly capture the spirit of New Mexico. Headed that way at 7am, very excited! Thank you for sharing! Why, thank you. Meanwhile, know that it’s turning colder! Cloudy and damp for a few days. Lows in the forties and high thirties.